Stanley Burrows was born on 22 December 1891, probably at Seavington St Michael, near Ilminster, the son of Harry Burrows (b 1864) and Eva née Pigeon (b 1862). In the 1901 census Harry, a rural postman, was living next door to the post office in Seavington St Mary with Eva and their family; Ethel born 1890, Stanley born 1891, Hilda born 1896 and Elsie born 1901. In 1910 Stanley joined the Royal Marine Light Infantry of the Royal Navy and the 1911 census listed 19-year old Stanley as a Private at the Royal Marine Depot at Walmer, Kent. In the meantime his parents and sisters had moved to 61 West Hendford, where Henry ran a dairy and grocery business assisted by Eva. Sadly we know little of Stanley's early career in the Royal Marine Light Infantry although by 1916 he had achieved the rank of Corporal. He served aboard HMS Indefatigable, a Royal Navy battle cruiser and the lead ship of her class. Her keel was laid down in 1909 and she was commissioned in 1911. She was an enlarged version of the earlier Invincible class with a revised protection scheme and additional length amidships to allow her two middle turrets to fire on either broadside. When the First World War began, Indefatigable was serving with the 2nd Battle Cruiser Squadron in the Mediterranean, where she unsuccessfully pursued the battle cruiser Goeben and the light cruiser Breslau of the German Imperial Navy as they fled towards the Ottoman Empire. The ship bombarded Ottoman fortifications defending the Dardanelles on 3 November 1914, then, following a refit in Malta, returned to the United Kingdom in February where she rejoined the 2nd Battle Cruiser Squadron. The Battle of Jutland was a naval battle fought by the Royal Navy's Grand Fleet against the Imperial German Navy's High Seas Fleet. The battle was fought in the North Sea near Jutland, Denmark. It was the largest naval battle and the only full-scale clash of battleships in the war. Fourteen British and eleven German ships were sunk with 6,094 killed and 674 wounded on the Allied side and 2,551 Germans killed and 507 wounded. Indefatigable was sunk on 31 May 1916 during the Battle of Jutland. Part of Vice-Admiral Sir David Beatty's Battle Cruiser Fleet, she was hit several times in the first minutes of the "Run to the South", the opening phase of the battle cruiser action. Shells from the German battle cruiser Von der Tann caused an explosion ripping a hole in her hull, and a second explosion hurled large pieces of the ship 200 feet (60m) in the air. Only two of the crew of 1,019 survived. Stanley, aged 24, was killed as a direct result of this enemy action but his body was not recovered. On 9 June 1916 the Western Gazette reported "Townspeople generally will regret to learn that a number of Yeovilians were on the various ships sunk on Wednesday last in the battle off the coast of Jutland.... Mr and Mrs H Burrows, of West Hendford, have received an official intimation that their only son, Corporal S. Burrows (R.M.L.I. ), of H.M.S. Indefatigable, was amongst the drowned. Corporal Burrows joined the Navy in 1910 and was 24 years of age." 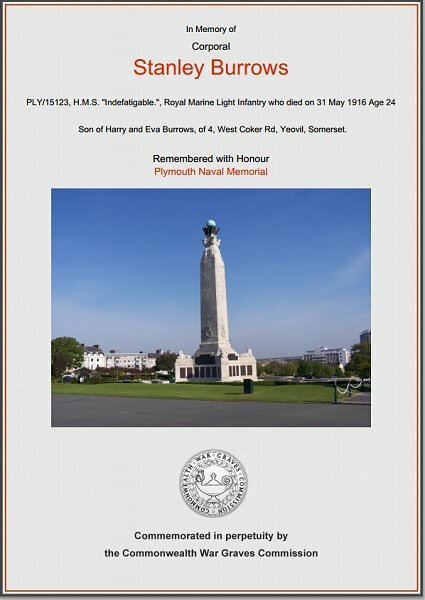 Stanley Burrows' name is recorded on Panel 18 of the Plymouth Naval Memorial and on the Yeovil War Memorial in the Borough. The Commonwealth War Graves Commission certificate in memory of Stanley Burrows.